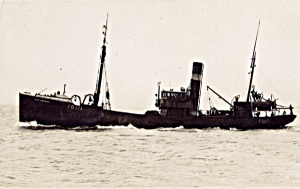 31.5.1915: Launched by Cook, Welton & Gemmell Ltd, Beverley (Yd.No.321) for Humber Steam Trawling Co Ltd, Hull as SEA SWEEPER. 27.11.1915: Registered at Hull (H409). 9.12.1915: Completed (Richard Henry Hobbs, manager). 1.1916: Requisitioned for war service as a minesweeper (1-12pdr, Hydrophone) (Ad.No.1979). Based Harwich. 17.12.1917: Sailed Falmouth for Portland. 3.11.1919: Sold to Fresh Fish Supplies Ltd, Hull (Thomas Nightingale, manager). 8.2.1922: Sold to Thomas Hamling & Co Ltd, Hull (Harold Hall, manager) along with SEA MONARCH (H411) for £11,500 each. 6.1.1926: Thomas Boyd appointed manager. 4.5.1928: Sold to Dinas Steam Trawling Co Ltd, Fleetwood (Joseph Arthur Marr Jnr, manager) along with SEA MONARCH (H411) for £7,000 each. 1.6.1928: Mortgaged to William Deacons Bank Ltd, London. 11.6.1928: Registered at Fleetwood (FD171). 11.1939: On a trip to Co. Donegal grounds (Sk. A. Tomlinson); eleven crew. 20.11.1939: Trawling 25 miles NW by W of Tory Island, Co. Donegal at 5.05 pm. 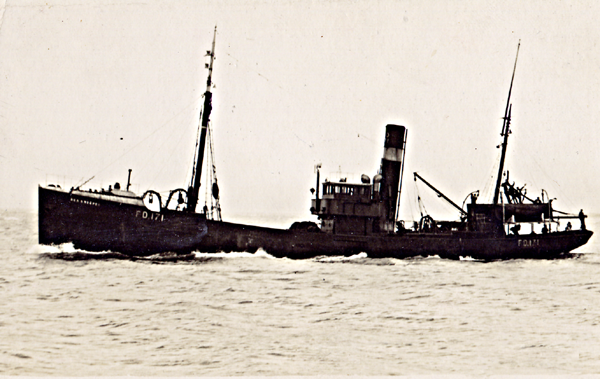 stopped by U-boat (U.33) crew abandoned to boat and subsequently sunk by gunfire; crew picked up by steam trawler LOIS (FD424). 28.11.1939: Fleetwood registry closed “Sunk by enemy action”. This entry was posted in Steam Trawlers, Steamers (Picture), War Losses and tagged Dinas, Lost, War Loss on January 26, 2009 by Fred Smith.